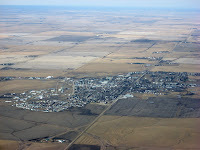 The Journey: Flying Into Calgary! Cue Dramatic Music. On Friday (Apr 13) the time finally came to separate the men from the boys. Sorry ladies. 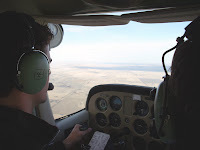 One likely never forgets their first flight into controlled airspace, even if that memory is mostly one large blur, punctuated by sharp quick radio calls, and all overshadowed by a tone of rushed annoyance. Its not unlike a new driver's first trip into downtown Toronto, or perhaps getting caught in the mad rush down the Gardiner Express Way, following a Leafs game at the ACC. You're entirely not ready for it, no matter how prepared for it you may think you are. The procedure for flying into controlled airspace is quite simple in theory. You talk to air traffic control and let them know what you want to do and they tell you every step to do, until you're there. In practice, however, it's not so simple, and if you feel rushed, it becomes even more intense. I learned that the first rule of talking to ATC is: Know what you're going to say, before you push the button to say it. For example, at one point I thought I heard ATC tell me to turn to a heading of 816, so naturally I repeated it saying that I would be turning to 816, as you're supposed to. As anyone who's been through junior high math knows, there are only 360 degrees in the compass so a heading of 816 doesn't actually exist! Fortunately my instructor quickly sorted that one out. Second rule of ATC communication: Don't offer any information they don't ask for. If they ask you if you can see the other plane in front of you, even if you had him in sight until just a few seconds ago, just tell them you can't see him. Don't say, 'Well...I had him in sight'. This wastes time, tells the ATC nothing of use and it's very hard to tell, on the radio, the difference between the words 'had' and 'have' – each with a significant difference in meaning. Less is more when dealing with ATC guys. Think of it this way, the less you say, the less there is for them to get upset at you for – and they do get upset with you. Which leads me to the third rule of ATC communication: Keep it short. It may feel like you're the only guy they care about in the sky, and the warm fuzzy feeling you get when ATC actually says your call sign can be misleading. 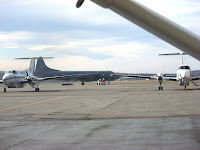 On average, they're in contact with about 20 or 30 other aircraft whose main engines could swallow your little airplane whole if they got the chance. Our little Cessnas are merely the gnats buzzing around the proverbial ear of the air traffic controller. So when you come on the radio with some long drawn out spiel about what you're doing or would like to do, they don't take to kindly to it. Most calls should be about 3 to 5 words. They don't usually even constitute full English sentences. Here I am, standing outside the ESSO building, where we shut down and occasionally fill up on overpriced fuel. Even if you don't get fuel, they still try to charge you $70 for stopping on their little patch of tarmac. Fortunately Erik played the 'poor little student on a training flight' card and we got out of it. I noticed a very interesting phenomenon as I was landing. 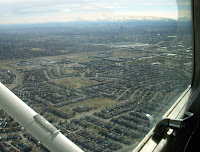 Usually, when landing at Three Hills, all of your concentration is on the approach, the flare and the landing, and you have very little concentration left over for things happening in your peripheral. 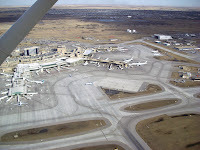 I noticed that at Calgary, the increased congestion required some of my concentration, stealing it from what would normally go toward the landing. And here's the interesting part. When you have less active concentration to spare for the landing and approach, your training and instincts fill in for you. 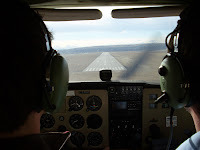 Not to say that you can switch your brain off, but rather, once you've learned something like landing and practiced it over and over, it becomes second nature, leaving you free to concentrate on other traffic, and the ATC instruction. You just want to be sure that you've been trained well. 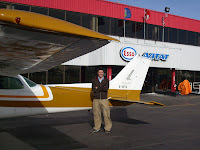 Turned out that I had a great landing in Calgary, and that's less of a comment on my skill and more of a sign of the excellent training by both my instructor and the Prairie Aviation program as a whole. By the way, this large grey Canadian Forces plane was taking off just behind me and climbed out over my head by about a 1000 feet. As if he needed to add to his intimidation factor, his call sign was Demon 1-4. That was an awesome trip. Thankyou for taking me along. I will return the favor very soon. You did awesome man. I love hearing from people who are passionate about what they do and so thoroughly enjoy their work/studies/life. You are so obviously in the right place at the right time.